What is heartworm disease? How does a cat become infected? Heartworm disease typically affects dogs, but occasionally occurs in cats. The disease is caused by a parasite called Dirofilaria immitis, better known as heartworm. The parasites are long, hair-like worms that prefer to live in the right side of the heart and the pulmonary artery, which is the large blood vessel that carries blood from the heart to the lungs. Cats become infected when they are bitten by an infected mosquito carrying immature worms called Stage 3 larvae (L3). 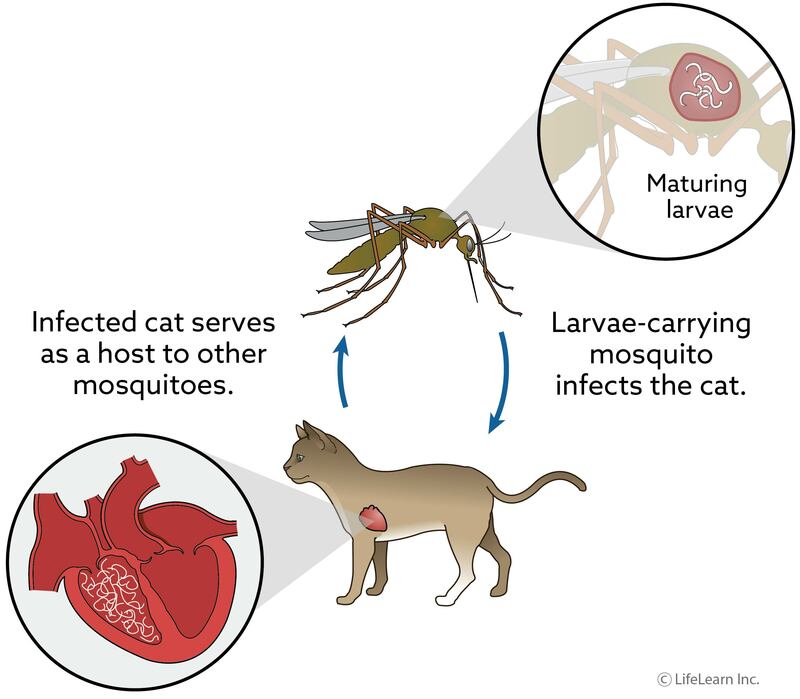 When an infected mosquito bites a cat, the larvae pass from the mosquito into the cat. Is heartworm disease the same in cats as it is in dogs? Dogs are the normal host for heartworms. This means parasites are able to complete their life cycle, maturing into adult worms that live in the heart. They are able to mate and reproduce, producing immature worms called microfilaria that circulate in the bloodstream. 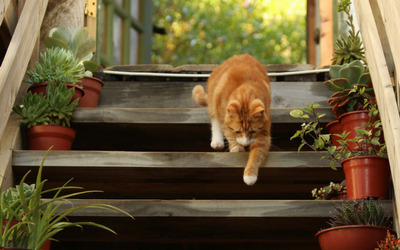 "The cat is not the normal host for heartworms..."
However, the cat is not the normal host for heartworms, and the parasites typically are not able to complete their life cycle. They either die in the tissues, especially the lungs, or get 'lost' and end up in abnormal places like the brain, the skin, or body cavities. A small number of worms are able to mature in the heart, but there are usually too few adults to mate and produce microfilaria. On rare occasions microfilaria are produced, but the microfilaria are typically present in the blood stream for only a brief period of time. Is heartworm infection common in cats? Heartworm infection in cats is much less common than in dogs. Studies have estimated that for every 100 dogs that develop heartworm disease, only 5 to 15 cats are infected. "Heartworm infection in the cat is difficult to diagnose, and the true rate of infection may be higher than initially estimated." However, heartworm infection in the cat is difficult to diagnose, and the true rate of infection may be higher than it appears. The distribution of heartworm disease in cats is similar to that of dogs. In the United States, most cases are reported along the southeastern and gulf coasts and in the Mississippi River valley. In Canada, heartworm infection in cats is much less common, with most cases reported in southern Ontario, southern Manitoba, and southern Quebec. The risk of infection is greatest when mosquitoes are actively feeding. This typically requires an average daily temperature of more than 64°F (18°C). In areas that get killing frosts, the risk of heartworm infection is limited to the warmer months of the year, from late spring to late autumn. By comparison, in subtropical United States heartworm infection is a year round risk. Can infection be spread directly between cats, or from cats to people? Cats can only get heartworm from an infected mosquito. There is no spread of infection from cat to cat, cat to dog, or from cat to people. What are the clinical signs of heartworm disease in the cat? Many infected cats have no noticeable signs of illness, while others may show vague or non-specific signs such as lethargy, lack of appetite, or weight loss. Some cats develop obvious signs of illness, typically difficult breathing, coughing, and vomiting. Some cats develop heart murmurs or have fluid build-up in the chest or abdomen; seizures and other abnormalities of the nervous system have been reported. A small number of cats die suddenly without warning. How is heartworm disease diagnosed in the cat? Heartworm disease in the cat is difficult to diagnose and a variety of testing methods are usually needed to confirm infection. These include blood tests, X-rays, and echocardiography (ultrasound of the heart). Routine blood tests (see handouts "Complete Blood Count" and "Serum Biochemistry" for more information) may show non-specific changes such as high eosinophil count or high globulin level. Blood tests that are more useful include the antibody test, which is able to detect early stages of heartworm infection, and the antigen test, which may detect the presence of adult worms later in the course of disease. A test for microfilaria may also be done, although it will be negative in the vast majority of cases. What do positive test results mean? A positive antibody test indicates there has been exposure to heartworm larvae, which increases the probability that there is underlying heartworm infection. A positive antigen test confirms heartworm infection and indicates that adult heartworms are present. However, neither the antibody test nor the antigen test is 100% reliable. The two tests may give contradictory results or be inconsistent with the signs the cat is showing. A positive microfilariae test confirms that at least one male and one female adult worm are present. Radiographs of the chest and ultrasound of the heart may reveal changes in the heart, lungs, and major blood vessels that support a diagnosis of heartworm infection. Is there treatment for heartworm disease in cats? Unlike treatment in the dog, drugs to kill adult heartworms are not usually given to cats due to the serious and potentially fatal complications that often follow such treatment. Since adult heartworms are relatively short-lived in the cat, infection is often self-limiting and frequently resolves spontaneously. Treatment is usually limited to drugs to control the inflammation triggered by the presence of the worms in the lungs, and other medications such as bronchodilators to make it easier for the cat to breathe. In serious infections, surgical removal of adult worms from the heart may be the best option. Critically ill cats may need to be hospitalized for further care. Can heartworm disease in cats be prevented? Heartworm preventatives are available for cats and should be used in areas where there is a high rate of infection among dogs and therefore an increased risk of infection for cats. Your veterinarian can advise you on whether a preventative program is appropriate for your cat. See handout "Heartworm Disease in Cats" for additional information about heartworm disease.